Once again Human Weapon hosts Jason Chambers and Bill Duff take it on the road in their quest to train and scrap with some of the world's best martial artists. This is the episode we've been waiting for - Karate - the Okinawan art of empty-handed combat. As usual, our trusty guides are bemused, abused and amused by the rigorous training regimens they endure during their brief stay on the island of Okinawa. Some of the training methods displayed on the show are rarely practiced anymore, especially in the West. 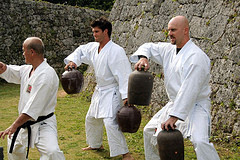 True karate entails turning parts of the body into viable weapons, as some of the Okinawan masters demonstrated with board breaks utilizing nukite (fingertips strike) and an impressive baseball bat break using a special back-wrist technique. Also explained was kyoshu-jutsu - vital point striking which included a palm-heel technique delivered to the chest that is capable of stopping the heart. I especially liked the segment on the traditional hojo undo karate equipment that many karate practitioners may have never seen or heard of: Kongo ken - oval metal weight. Tou - bamboo bundle used for nukite strikes. Nigiri game - gripping jars filled with sand or water (see photo). And of course, the makiwara - the striking post. I've already written about some of karate's iron-body exercises, so I won't go into that here. But I had to laugh when Duff quipped that it was "hard to not hit back" when he was being struck about during a body toughening routine. This is an episode I wish I could have seen, but alas I don't have cable. I am still reeling from this episode. I found these two guys laughable. I can not believe they actually felt that they were learning something and that they stood a chance in kumite. I didn't feel this show was really representative of either karate and/or styles such as Goju and Uechi. TV editing was done and the persons doing so apparently have no real understanding of what they were seeing. Did you hear their pronunciation of karate and karate-ka. I am so flabbergasted that I am unable to put together any real sensible explanation of what happened. I felt the Masters showcased were just having some fun and in the end I felt that their stoic faces showed that this was not real karate. I didn't catch the whole thing (waiting for the rerun), but it as great! I can see how many martial arts (like TKD) have a base in karate. Pretty cool! I saw this episode last night. I agree with Charles james, the hosts are laughable. And..there were lots of interesting bits of information, but the way the show was edited, you couldn't possible have an understanding of karate and the different styles and techniques being shown. I think this show could have been 2 hours long and been more comprehensive. I'll watch it again as I have been with the other episodes. But its a little disappointing when you know that there is so much more to it than what is being shown. Wish I had seen it. How was the kumite section? I agree, "the way the show was edited, you couldn't possible have an understanding of karate and the different styles and techniques being shown", but then just how much can you show in just an hour. I studied Uechi-ryu for several years and although it was taught in Okinawa its origins are in China's Fukien provience and is considered an old style for that reason which uses open hand techniques as opposed to the closed hand that you see in most karate styles, but there are exceptions. I think with the hour they had they were trying to give a broad overview of okinawan styles, but your right, the kumite was laughable. Me neither. I ended up watching it at a relative's house. I thought it was well done for the most part. The hosts are knowledgeable in their own right, but I don't think they're losing sleep because of occasional screw-ups like mispronouncing foreign terms. I don't think either one of them really have a traditional martial arts background, and if they claim to, it's questionable. I can see how many martial arts (like TKD) have a base in karate. But its a little disappointing when you know that there is so much more to it than what is being shown. Agreed. I was disappointed (and surprised) that the role of kata wasn't discussed. Maybe the producers felt it wasn't exciting enough for TV. It was alright. If you were expecting Frank Dux vs. Chong Li, forget about it. But it was continuous sparring, and they allowed low licks a la kyokushin and muay thai. Duff nailed the Okinawan hard in the noggin and had him down another time. Both really big guys, which is rare to see in karate. It was called a draw because they were both standing when the clock ran out. I think with the hour they had they were trying to give a broad overview of Okinawan styles...but then just how much can you show in just an hour? Indeed. A lot was left out, I'll grant that. An hour can't really come close to fully exploring the depth and history of karate. I was excited to see Nai Hanchi Shodan being done at the second place they went to train. That's the first kata in my style. They did touch briefly on kata, which I was happy to see. I think there is just too much to cover. There are so many different styles and techniques that the few they discussed only scratched the surface. But interesting, nonetheless. If you watch the show without paying too much attention to the hosts it was interesting. I agree that an hour for karate is just not long enough, which left much to be desired in my eyes. But, this is not a show doused in historical facts and traditions, remember that. I, too, cringed at some of the pronunciations, but that's me, I get a little too control-freakish about that kind of thing, especially when it's related to something you love. In the kumite I noticed as well that the karateka were not holding their hands up, that they kept them low, but wouldn't that make sense in this case since you did not necessarily have to defend your head and face? It looked pretty brutal, especially the attacks to the legs. I loved that! No, I'm not a sadist...just love watching the sport. Anyway, my heart sank a little with this show since the other two shows did a very good job accurately representing the styles. Not that anything was inaccurate, just that it could have been more. But, there's always savate! Right, Naihanchi. We learn that one at about 6th kyu in Isshinryu. Wish they had shown some bunkai. There really is too much to cover in an hour. Still, they seem to do a pretty good job with it. In the kumite I noticed as well that the karateka were not holding their hands up, that they kept them low, but wouldn't that make sense in this case since you did not necessarily have to defend your head and face? Good question. Holding your hands low is the perennial mistake karate players make everywhere. How you train is how it happens, so having a low guard on the deck means you're exposed to getting clobbered upstairs on the street. Street fighters have one target: Your head. Welcome to my site. In spite of all the criticism it's received, I really like the show. I find it informative and entertaining. I think the "reality" aspect of the show may be unnecessary, that might change. Time will tell. You guys have to understand that the karateka that Bill was matched against is from Kyokushin. Kyokushin karate was devised by Masutatsu Oyama which incorporates elements of Shotokan, Goju-ryu, Muay Thai (that's where those low kicks came from), and several other martial arts. First off, the Kyokushin guy was taking it easy on the host Bill. In regular tournament format, Kyokushin allows knees to the face and body, kicks anywhere. And this is without protective gear mind you. Bare-knuckle karate. Punches and elbows are not allowed to the head and neck. Otherwise, everything else is fair game. Though it was a mistake, Bill technically committed a foul when he struck the Kyokushin karateka in the face. The reason for this format is that in the 1950's and 1960's, Kyokushin DID allow bare-knuckle matches, but too many students dropped out because of injuries so the founder modified tournaments to not include strikes to the head. Knees with unhindered clinching was also allowed as well, but broken ribs and internal injuries were the consequences. The Kyokushin guy also didn't use his high kicks against Bill since he was only a beginner. THIS would've Bill would've faced if the guy had gone more serious. I'm aware (as are most of my readers) that the hosts are not in the same league with the fighters they're pitted against in the final match. I don't think any of these matches on this show are indicative of anything real. They're glorified exhibitions. In my opinion, both opponents are "taking it easy". OH I loved this episode! It was wonderful. I can say that the Kyokushin champion did treat Bill with respect, and gave him good punishment, but he also did kumite with him as a Kyokushin Black belt fighting against a white belt. I believe that the champion limited himself to bringing the most out of Bill in a Kyokushin match. Since grappling, (grabbing the opponent) is not allowed, Bill couldn't use any of his developed skills. I felt a shiver of pride when I saw that the Sensei (s) had all come to stand at the side of the room when Bill went up to fight. It was such a moment of goodness, and support. I believe that the reason that the karate ka were holding their hands low during kumite training at the beginning of this karate episode was due to the focus of the training towards Gedan Mawashi Geri ( Low roundhouse kicks) in the first half hour of the show. Most Kyokushin Karate ka keep their guard hands up high ( almost similar to a boxers). All in all, I loved this episode, and I'm enjoying each show.